The Performance Management Tool for ambitious CEOs and their teams. Already use Reclaro? Log in. Focused teams make more progress and get stuff done more consistently. Reclaro enables you to build focused teams where the focus is not just on their own department or unit, but on the overall Core Objectives for the whole business. With multi-level Reclaro 1-3-5 Action Plans in place, everyone knows what they’re focusing on and responsible for. They can see in a matter of seconds how they are helping to move the dial on the business overall. Your team won’t just work hard, they’ll work hard on the right things, with rocket-fuelled results! We’ve been helping business for years to build 1-3-5 Action Plans. It became clear that, although the system of pdf plans worked well, there could be a better way. We’ve now built awesome software which is simple to use, we help you set up, and shows you at a glance if your business is on or off plan. 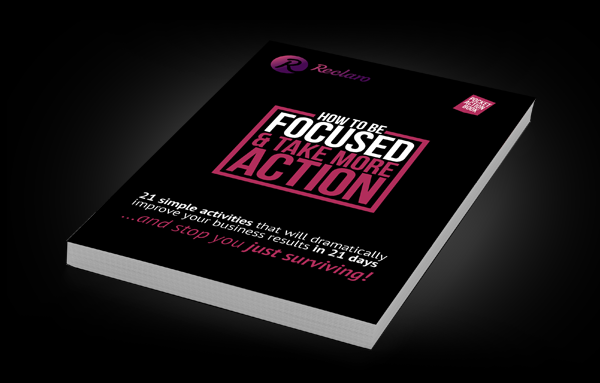 21 simple activities that will dramatically improve your business results in 21 days ... and stop you just surviving!